Arati (pronounced ar’ a tee) is an offering of respect, welcome, or worship to an exalted person. Since the most exalted person is the Supreme Lord, it is most appropriate to offer arati to Him. Aratis can be short or long. And time, place, and circumstance dictate how many aratis are offered each day. Whatever standard is established should be maintained. In a full arati, incense, a flame (ghee lamp), a conch shell with water, a cloth, flowers, a chamara (yak-tail fan), and a peacock-feather fan are offered to the deity. While doing so, the devotee chants mantras appropriate for each article and rings a bell with the left hand. In a short arati, incense and one or more of the articles used in the full arati may be offered. * Special Note * : Monday thru Thursday evenings, Arati is the first part of Integrated Yoga Night, when we flow from one form of devotional yoga to another. Click here for details. Here below is a video of arati at the World Headquarters of the International Society for Krishna Consciousness (ISKCON) in Mayapur, West Bengal. Below is the description of a typical day of worship as conducted in large Krishna Temples. Worshipping God through His tangible form – the Deity – is called aratiWorshipping God through His tangible form – the Deity – is called arati. Deity worship means caring for the Lord as a person. By serving the Deity we understand ourselves to be His servant, with practical service to offer. Krishna is a person, and when we care for Him He reciprocates with us by purifying our heart and bringing us closer in our relationship with Him. The Lord is awakened early in the morning; then He receives a snack and is worshiped with a traditional ceremony known as Arati. Then He is massaged with oil, bathed with water, dried with a towel, dressed, and ornamented with jewelry, flowers, flower garlands, and Tulasi leaves. The Lord receives breakfast and His next Arati. At noon He is offered lunch and an Arati, after which He takes a nap. 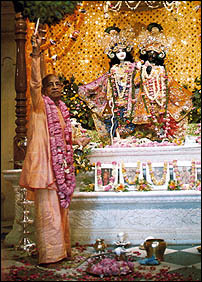 On awakening, He receives a snack and another Arati. In the evening He receives His evening meal and another Arati. Then He is dressed in His night clothes, offered another arati, and laid to rest in His bed.